The 2015 Award Circuit will be a collection of reviews of films that are in some kind of award runnings within the months of January through March. Not only will this prepare me for the big night (AKA Oscar Night), but it will also allow me to catch up with some of the critically acclaimed films I missed out on in 2015. I hope you enjoy reading them as much as I enjoy watching and writing them. To simply call "Carol" a LGBT film or anything of the sort would totally be wasting its merits. Yes, it is a movie about two women who slowly fall for each other, but much like "Brokeback Mountain" a decade ago, there is much more going on here than meets the eye. Carol Aird (Cate Blanchett) is a gorgeous and elegant woman who is going through a harsh divorce from her husband Harge (Kyle Chandler). Not only that, but because of the separation, she is fighting for custody of her daughter. One day during the Christmas season, Carol makes a purchase with a shop girl named Therese (Rooney Mara). They make small talk, seem to like each other. Then Carol accidentally leaves her gloves on Therese's table. Therese mails the gloves back to Carol that same night. Carol and Therese begin to meet more frequently and there is something that keeps drawing them back together, to discover more of each other. Yes, somewhat of a romance flourishes between the two. I think the romance in "Brokeback Mountain" came from a loneliness between the two men. In "Carol," it seems stemmed from a particular need. Therese is in a state of uncertainty, there is a man who has proposed to her, but she doesn't know if she wants to commit. Meeting Carol makes her emotions, her wants and her needs that much more confusing. Carol is suffering from the ugliness of her divorce, and while that put an impossible amount of strain on her, there are also memories of her past that point to several different avenues. Perhaps Carol isn't who we think she is, or who her husband thought she was. 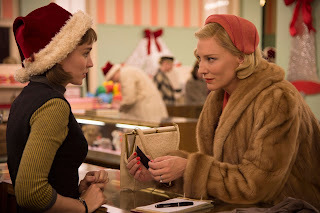 If "Carol" is about anything, it it about uncertainty and how we use that to navigate our emotions and our dreams. We try to find out who we are and what we really want out of our lives. We want to figure out the type of person we are going to be, and once we figure it out, we embrace it. That is where "Carol" heart truly lies. As much as it is a optimistic movie, it is a movie that really embraces the 1950's. The sets, the costumes, the music, the cars...all give the movie hypnotic glow. "Carol" feels just as much a time machine as it does an emotional think piece. Not only that, but it explores some of the norms and attitudes of the era without flinching, which is exactly what the film should have done. The feelings towards homosexuality, towards women and their place in our society, towards being clinically insane is all tested here, and it is rough reminder of what our society looked like at one point. The filmmakers never pull back, they never pander. They tell the story with an authentic glimmer of imagination. But what really makes "Carol" click is the beautiful relationship created by both Cate Blanchett and Rooney Mara. Their performances are the glue to the entire story, and I am not surprised at all that both of these actresses are up for Oscars next month. They are both profound and subtle and earn every piece of their relationship with each other. I liked that their relationship is a slow burn, and it takes a lot of the movie before its evident that Carol and Therese are into each other. Relationships, whether intimate or friendly, take time to nurture and when they are romantic, you need time to go over your feelings, making sure they are what they appear to be. "Carol" celebrates that time and relishes is, creating something that looks and feels believable. I also give credit to Kyle Chandler, who delivers another great performance in a career of great performances. For any fans of Fox's "Gotham" series, Corey Michael Smith who plays Edward Nygma on the show, makes a brief appearance in the movie. He's very good here too. I enjoyed that "Carol" wasn't about two women fall in love for the sake of it. There is real passion and real drama in the story that unravels. It is brought to life by two stellar performances under a very realistic 1950's backdrop. There is much to appreciate here.